New York - Airline fare wars are making a comeback. 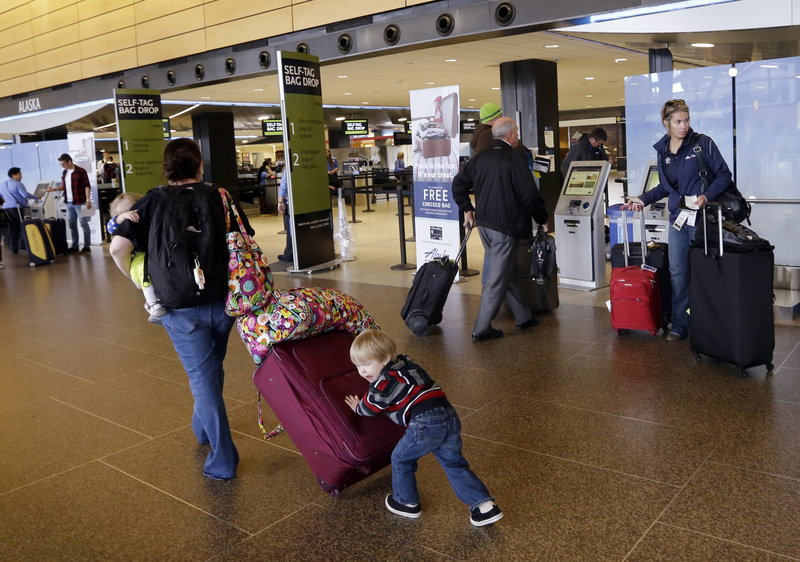 Don’t expect widespread sales or cheap flights home for Thanksgiving. But a number of cities are seeing ridiculously low prices at off-peak hours — prices the industry has spent the years trying to eliminate. Fliers have been able to fly Chicago to Boston for $80 roundtrip, San Francisco to Las Vegas for $67 roundtrip and New York to Los Angeles, with a connection, for $150 roundtrip. “This is the big break consumers have been waiting for in response to lower fuel prices,” says Seth Kaplan, managing partner of industry newsletter Airline Weekly. The price of oil is at the lowest level in six and a half years and the industry is saving billions of dollars on fuel, giving airlines leeway to cut fares but still post healthy profits. Airlines have also added larger, more efficient planes to their fleets while packing more seats into existing jets. So, while the number of domestic flights is down slightly over the past 12 months, there are now 3.4 percent more seats for sale — too many to meet the demand in all cities. To fill those extra seats, airlines have had to offer discounts. American Airlines and — to a lesser extent — Delta Air Lines and United Airlines are matching some of the discount fares. By doing so, they actually undercut the ultra-low-cost carries because Spirit and Frontier charge customers extra to use overhead baggage bins or to have a drink of water. “They’re trying to force them out of the market and they have the power to do this because they are making record profits,” says George Hobica, founder of travel deal site AirfareWatchdog.com. Spirit and Frontier each carries less than 2 percent of all domestic passengers. American, United and Delta made $6.6 billion in combined profits during the first half of this year, so they afford to fight back on routes such as Chicago to Atlanta. Delta and United declined to comment. However, Delta has expanded its “Basic Economy” fare to more than 450 markets. Fliers booking these tickets typically save $15 each way, but are not given advanced seat assignments, can’t cancel or change the flight and are last to board. Today’s airline industry is more disciplined, so the fare wars cause much less damage. The airlines still collect substantial fares on highly-profitable business routes and for holiday travel. Additionally, they take in billions in dollars fees for checked baggage fees and other things that were included in the ticket price back in the 1980s. Even passengers unable to take advantage of today’s bargain-basement deals are getting a tiny bit of relief. The average cost of a roundtrip domestic ticket, including taxes, purchased during the first seven months of this year was $494.12. That’s down $5.41, or 1.1 percent, from the same period last year, according to the Airlines Reporting Corp., which processes ticket transactions for airlines and travel agencies. Prices are still higher than they were in 2011, 2012 and 2013, even when adjusted for inflation. And the small drop in ticket prices is nothing compared to the 31-percent savings airlines have seen on their fuel bills since the start of this year. Wolfe Research analyst Hunter Keay says that two out of every five domestic flights — local market ones or connecting trips — can be affected by what happens in Dallas. “If passengers are willing to connect in Dallas, they are willing to connect in Chicago,” says Keay. The Associated Press purchased a $40.10 one-way ticket on American Airlines from New York’s JFK Airport to Dallas-Fort Worth, departing at 3 p.m. on Tuesday. Government taxes and fees were $15.91, leaving American with $24.19 for the 1,391-mile trip. All but five seats on the 160-passenger jet were occupied. Many passengers were coming off highly-profitable international flights that arrived earlier in New York. Others were just connecting in Dallas, heading on to places like Oklahoma. Brandon Perdue, a college student, booked the cheapest one-way ticket he could find from New York to his home in Los Angeles four days before traveling. Even with a connection in Dallas, it cost $650. “I feel ripped off,” Perdue says. It didn’t help that he paid $25 to check a suitcase and an extra $100 fee because it weighed more than 50 pounds. The AP bought its ticket 22 days in advance, at a time that American’s booking algorithm predicted low demand for the flight.